From the back cover: "There's a case of spring-cleaning fever going around New Orleans's historic Garden District, and it's keeping Charlotte LaRue - proprietor of Maid-for-a Day - plenty busy. Especially when what's supposed to be a simple housecleaning job ends in a grim discovery - and things start to get real dirty real fast." Enjoyed this one. Charlotte is a likeable sixty year old sleuth who owns a house cleaning agency. I would read more in this series. Received in the Recent Mysteries Virtual Bookbox. Good mystery. Lots of suspects and lots of red herrings here! 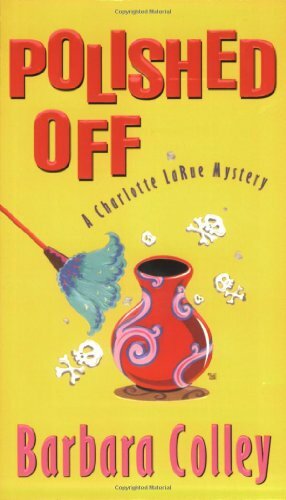 I agree with loveamystery---Charlotte LaRue is a very likeable, and a very practical, sleuth, for example,the oil idea! What happened to poor Missy though? coffee, goodies and good company. Somewhere around Queen Elizabeth Theatre plaza, depending on the weather. Enjoy the Word on the Street event! Like this one, hope to read more books Want to see if her romance works out. picked up at Rhizome on 11 December - will donate to our Family Resource Library at BC Children's Hospital.